Boy, can pocket Jacks look good when you haven’t been dealt a decent hand in half an hour. They’re also incredibly vulnerable and need to be handled with caution. Hesitate to call big re-raises pre-flop. What would they be holding to do that? Thin the field pre-flop. Multiple opponents and an overcard on the flop and you’re almost always beaten. Pocket Jacks (sometimes called fish hooks for the resemblance of a J to a fish hook) are one of the most difficult hands to profitably play in No-Limit Hold’em. It is a good, but not great, made hand that is a sight for sore card dead eyes preflop but quickly turns into a problem hand when one or more overcards appears on the flop. 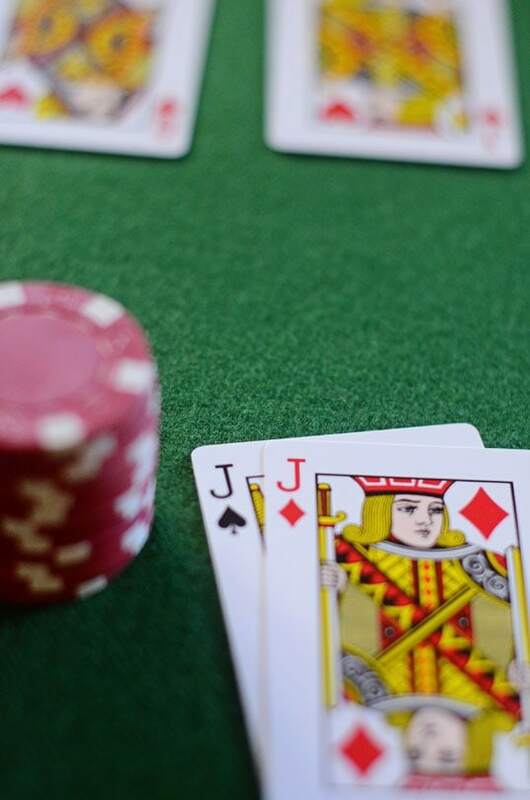 Pocket Jacks also require greater attention in cash games, which typically feature better play and can cost you a lot more than a single tournament buy-in when you misplay a hand. In this piece, I would like to give you some of my own methods for dealing with this troublesome No-Limit hand. 1.1 How Strong are Pocket Jacks? How Strong are Pocket Jacks? Before I delve into specific strategy, let’s examine the actual strength of pocket Jacks without any information from your opponents. Certainly, pocket Jacks are worthy of playing. It is the 4th-highest pocket pair and a made hand, meaning that you already have a fairly strong hand without improvement from the board. Only pocket Queens, Kings, and Aces have you beaten preflop, obviously. Statistically speaking, you won’t run into these better hands terribly often, but when you do the hand can turn very expensive if you’re stubborn and don’t see the writing on the walls. More often, you will be up against overcards like A-K, A-Q, or K-Q if you are in a raised pot. Unfortunately, you’re only in a coin-flip situation against overcards that go to showdown. You should only want to play big pots with big hands in No-Limit Hold’em. 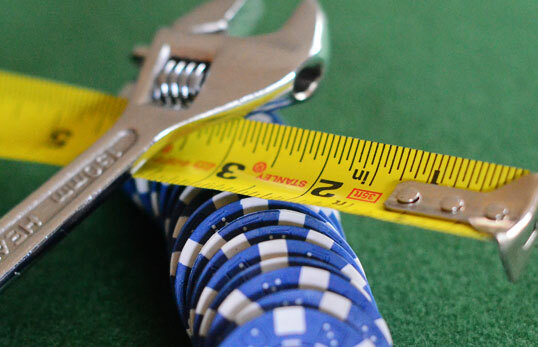 Unfortunately, pocket Jacks don’t quite make the ranks of other “big” hands because of their glaring vulnerability to bigger pocket pairs and overcards. I will usually raise 3-4x the big blind about 80% of the time if I’m opening the pot (the first one to make a raise) in any position. Many strategy books will discount hands less than pocket Queens from under the gun. I think that’s a bit too tight for good players. Just be sure not to over-commit from early position and play it mostly like a small pocket pair on the flop. The other 20% I will just call. My reason for raising is to thin the field and gain information from my opponents. If I am reraised, I can narrow my opponent’s probable holdings to a higher pocket pair or a big Ace. If it is a small reraise, I will probably call and rely on my reading abilities on the flop. If it is a large re-raise, I will often fold. If I get limp-re-raised, I will almost always fold unless it is a tiny raise as my implied odds would still be large. A call from my opponent(s) could mean anything. The 20% limping with Jacks is used to minimize risk and mix up my play. If the pot is raised before I act, I will call about 70% of the time and make a small reraise the other 30% of the time. Against a raise pre-flop, I play pocket Jacks similar to a small or medium pocket pair in that I try to keep the pot small and flop a set before committing much money. The occasional reraise is, again, mostly for information. If I am reraised again, I am likely beaten already. Much of your action on the flop and beyond with pocket Jacks will depend on your opponent(s) and how the action went pre-flop. Most of the time, you’ll either have called a small raise pre-flop or you’ll have made a small raise yourself and were called by one or two players. The flop is usually very tricky with this hand as, statistically, at least one overcard will appear 2/3 of the time. However, that 1/3 of the time that I have an overpair to the flop, I will bet aggressively. If you get flat-called, try to examine the board for possible draws and play accordingly on the turn and river. If you get raised on a 10-high flop, be on the lookout for A-10 and continue to bet for value. I frequently get lots of action from A-10 and K-10 on such flops. While I can’t account for every variable here, the main point is that you can (and should) bet with at lot more confidence with ragged flops. At the same time, this is the worst type of flop if you’re up against a larger pocket pair. There is no easy answer for when to release Jacks here other than be ready to much your hand to a reraise or two. The best that can happen is a call/fold in this situation. Catching a flop with overcards with pocket Jacks makes it much easier to get away from them cheaply. As mentioned above, this type of flop is what you’ll see 2/3 of the time. Of course, just because there is an overcard on the flop doesn’t mean you should give up right away every time. If you’re heads-up and made the raise preflop, try making a continuation bet of 1/2 to the full size of the pot. You should do this more frequently with only one overcard rather than 2 or 3. Frequently, you’ll pick up the pot right there. You will just about every time that you opponent doesn’t pair up or hit a good draw. However, with 2 or more opponents and overcards on the board, I would recommend checking and folding to good-sized bet. Defending less than top pair to showdown is a fast way to lose a lot of money in no limit Hold’em. As I play mostly cash games, the above strategy is ideal mainly for cash games. In tournaments, I will play pocket Jacks a bit stronger and be willing to risk more chips. The main reason for this is that players will generally play looser and poorer in tournaments than in big cash games. I’m usually not willing to call all-in re-raises in a cash game with pocket Jacks as not too many good players will go all-in with worse than pocket Queens. In tournaments, not only will players go all-in with lower pocket pairs, they may also go in with hands like Q-J or J-10 in later rounds. As the blinds increase, pocket Jacks can definitely become all-in hands and are worth a lot more than in your typically tight-aggressive cash game. Always keep in mind that big pots are for big hands. 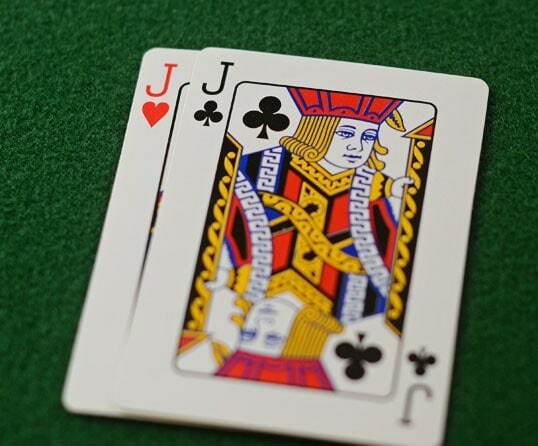 Unless you hit a set or better, pocket Jacks can be extremely vulnerable to both overcards and bigger pocket pairs. While you do already have a made hand, I recommend keeping the pot relatively small preflop. You should also be very careful when you face a lot of pressure on small-card flops. I have seen too many players go broke with pocket Jacks and Queens against Kings and Aces when all the money goes in on a 7-high flop. Remember to bet strongly heads-up on the flop, be ready to concede multi-way flops with overcards, and always be more willing to play in position.